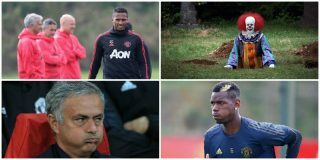 Manchester United captain Antonio Valencia has been forced to apologise after liking an Instagram post which called for under-fire manager Jose Mourinho to be sacked. Following United’s dire Champions League draw with Valencia on Tuesday night, the fan account describes watching United play under Mourinho as a form of ‘punishment’ before suggesting his position as manager has now become untenable. With the boss taking shots from all angles, including a piece we ran called The Verdict, the United skipper’s Instagram activity did little to dispel reports of disharmony within the camp. The Valencia fan account, teamvalencia25, said: ‘I’m not even surprised about the outcome of this game. I always look forward to out games but recently Mourinho has made watching us a punishment. On Wednesday morning, however, Valencia took to Twitter to say he liked the post without reading the caption and apologised for doing so. ‘Yesterday, I liked a post on Instagram without reading the text that accompanied the picture,’ he wrote. If these issues keep coming from social media, Mourinho is going to have to put a ban on players’ activity. It’s simply not worth it, though the players will probably end up moaning about the growth of their brands as a result. Moreover, The Sun claims Mourinho has banned Paul Pogba from speaking about United’s crisis publicly. It is alleged that the French midfielder was told not to talk to the media after the club’s four-game run without a win. This is really a circus under Mourinho. Our patience is wearing thin.